The National Archery in the Schools Program, or NASP, was created in 2002 by the Kentucky Department of Fish and Wildlife Resources to address the lack of archery in physical education classes at public schools. To date, over 7.5 million youth have participated in nearly 9,000 schools across the United States and in Australia, Canada, New Zealand, and South Africa. 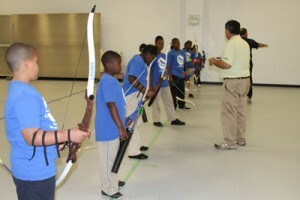 NASP teaches two-week archery courses to students in the 4th through 12th grade, focusing on the history of the sport, safety, technique, equipment, concentration, self-improvement, and physical fitness, specifically core strengthening. 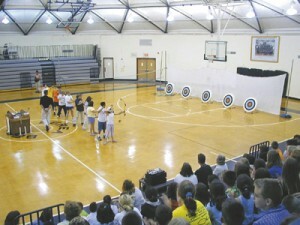 Prior to the course, teachers must complete an eight-hour NASP Basic Archery Instructor Training Program. Archers typically shoot in a school gymnasium at a distance of five to seven yards at 80 cm targets. These may be raised or set at floor-level in front of an arrow curtain. 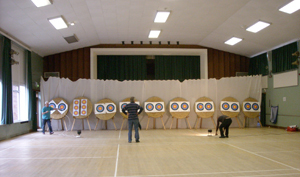 NASP hosts standard competitions as well as a wide range of online tournaments so that archers from different localities can compare scores. The Genesis bow, while ideal for NASP, is not really intended for tournaments outside of NASP programs or events. For example, the Olympic Games require a recurve, so a NASP archer who wants to go to the Olympics someday will need to switch to a recurve bow with a higher draw weight, a sight and additional equipment necessary for tuning. This applies to bowhunting as well as target archery, since a NASP archer who wants to progress to bowhunting would likely advance to a compound bow with a higher draw-weight, a sight and a mechanical release. This style of compound bow is also widely used in target competition settings. In both cases, the Olympic-style recurve and the standard compound bow would be significantly different from the Genesis bow and the archer would need to seek out additional coaching to learn about the new equipment and to study form techniques appropriate to higher draw weights. 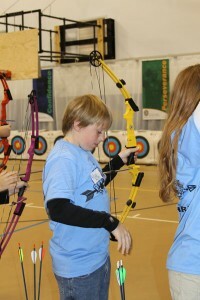 NASP has welcomed millions of people into the sport of archery in a safe, fun way. Particularly for those interested in shooting recreationally, or for those looking for an alternative to the more standard public school offerings, NASP is a great option and can transition into other programs such as JOAD. If a youth archer wants NASP in his or her school, they should ask an adult to contact NASP, which will send a trained representative to review the program with school officials.